Breathing air is the most important item of equipment, the basic condition for ensuring safe, certain firefighting when breathing apparatus is used. „My breathing air is pure.“ It’s good if you can be absolutely sure of this. Because in an emergency, you must be able to rely on the fact that each cylinder is filled with perfect breathing air. In perspective to that considerable responsibility, dedication must be regarded as the key word, especially regarding a subject which is often not recognized or even neglected: the dangers which may arise due to contaminated air. Improper operation of compressors, poorly maintained installations and the use of non-genuine or self-filled filter cartridges may indeed lead to fatalities! 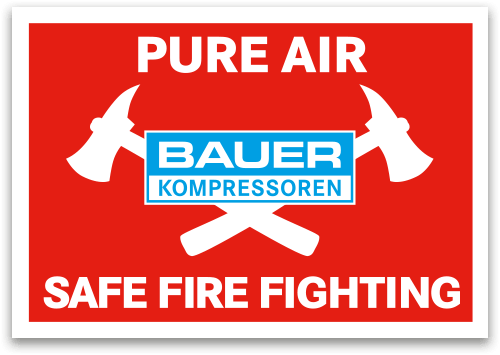 As global market leader for breathing air compressor units, BAUER KOMPRESSOREN is fully aware of her responsibilities and therefore started a worldwide information and quality campaign for pure compressed breathing air known as the BAUER PureAir Standard. With certification as a BAUER PureAir station, you gain an advantage over other fire fighting brigades: an attribute proving you to be a particularly safety-conscious and trustworthy company. Certification is world-wide done through authorized BAUER partners only due to whom BAUER KOMPRESSOREN is able to ensure that the required know-how is properly passed on and that installations and operators are audited by nothing but experts. In turn, PureAir certification provides you with legal certainty. In an emergency, you can document that your system was operated correctly and your breathing air quality was monitored. As the market leader in the breathing air industry, we and our pro¬ducts have always been synonymous with the very best breathing air quality. With high-efficiency purification systems that remove moisture, oil and carbon monoxide (CO). With our AERO-GUARD System to reduce carbon dioxide (CO₂) in compliance with breathing air standards, and B-SECURUS to monitor moisture saturation in filter cartridges. And, above all, with the new B-DETECTION PLUS System for seamless monitoring and logging of breathing air quality that complies with the DIN EN 12021:20141 standard. Our PureAir certification allows this quality to be documented at a glance – for your colleagues, and above all for you as the operator. Already the certification “PureAir Silver” enormously increases the level of breathing air safety compared to uncertified filling stations. 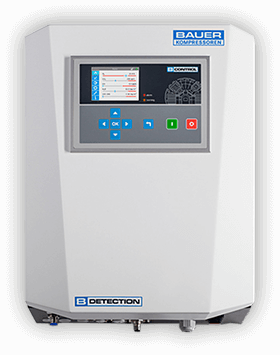 Integrated into the compressor or standalone version, sensors report automatically scheduled calibration and end of their life. To provide the very highest level of reliability, we have now introduced PureAir Gold. This new safety level proves to your customers that you use BAUER’s new B-DETECTION PLUS Online Gas Measurement System, and that you seamlessly monitor the quality of your breathing air throughout your operations in compliance with the DIN EN 12021:20141 Breathing Air Standard. Allowing you and your customers to rely on flawless top-quality breathing air in every cylinder. So you can always rely on each bottle is filled with perfect breathing air. 1 Residual oil measurement based on volatile organic compounds (VOCs) only. Sensor calibration based on isobutene. In case humidity is not completely removed from the compressed air it can lead to corroding metal components in breathing equipment or cylinders from the inside. In case residual oil in the breathing air is distinctly above the limit value, then the diver notices an oily or stale taste. In addition to acute irritation with coughing and breathing difficulties, nausea and vomiting are likely to occur. The oily mixture can form a permanent deposit in the lungs and thus damage the tissue when frequently inhaled. Particularly dangerous is the odorless and tasteless carbon monoxide (CO).  CO stops the bond of oxygen to the blood, thus causing an insufficient transport of oxygen towards all vital organs. This can and will cause headache, dizziness, nausea, unconsciousness and even heart failure. Even breathing in small doses under 0.01 vol.% (100 ppm) may cause chronic illness of the heart and nerves. Doses of 0.1 vol.% (1000 ppm) and higher are fatal after prolonged inhalation. Carbon dioxide is a natural component of air in very small concentrations. However, in higher doses it leads to breathing limitation and even respiratory arrest. The air breathed in containing too high concentrations of carbon dioxide accelerates heartbeat, increases blood pressure and causes shortness of breath and unconsciousness from a concentration of approximately 5 vol.% (50.000 ppm). Concentrations from 8 vol.% (80.000 ppm) can and will lead to lethal consequences within 30 to 60 minutes. 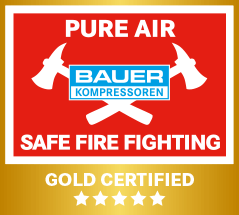 Outstanding quality and continuous monitoring: BAUER KOMPRESSOREN never makes any compromises concerning the safety and health of firemen.  For complete certainty, the only solution is to monitor breathing air continuously and seamlessly to verify compliance with the DIN EN 12021:2014 Breathing Air Standard. To achieve this, BAUER developed the B-DETECTION PLUS Online Gas Measurement System.  B-DETECTION PLUS measures CO, CO2 and O2 as standard and offers options for absolute moisture and residual oil (VOC)1. Automatic, continuous and ultra-reliable. The B-CONTROL control unit allows compliance with the threshold limits set forth in the Breathing Air Standard to be monitored at all times.  If limit values are exceeded, B-CONTROL displays a visual warning and shuts down the system before contaminated air can pass into the cylinders being filled. In cases where limit values are briefly exceeded, an automatic flush valve (optional) discharges contaminated air to the outside without interrupting operation of the system unnecessarily. To ensure highly accurate measurement results, BAUER uses high-quality temperature and pressure compensating sensors. 1 Absolute humidity and residual oil (VOC)  monitoring optional. Residual oil measurement based on volatile organic compounds (VOCs) only. Sensor calibration based on isobutene. Unfavourable environmental influences are responsible for permanently rising CO2 concentrations in the air. As a result, operators of breathing air filling stations are experiencing increasing problems in complying with the mandatory threshold limits specified in the DIN EN 12021:2014 Breathing Air Standard. AERO-GUARD is the reliable way to ensure that CO2 levels in compressed breathing air never exceed the permissible limit. To do this, the system uses a sophisticated bypass system which routes the air from the compressor intake through the AERO-GUARD before it is compressed. Part of this air passes through a special filter cartridge, reducing its CO2 content to around one-third of that of the intake air – far lower than even the strict limits set forth in the Breathing Air Standard¹. 1 Provided the maximum CO2 concentration of the air at intake is not exceeded. Purification is of eminent importance in perspective to health protection. Without proper purification remainders of oil, water, carbon monoxide and carbon dioxide will contaminate the compressed air. It therefore is most obvious that the purification system is the all decisive factor in processing breathing air. All BAUER high pressure breathing air compressors are equipped with field-proven purification systems. 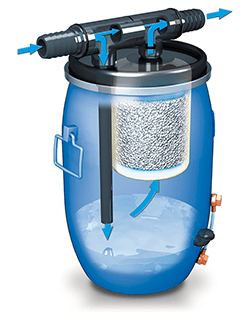 These purification systems provide for the use of genuine BAUER filter cartridges a reliable breathing air purification in accordance with DIN EN 12021:20141. 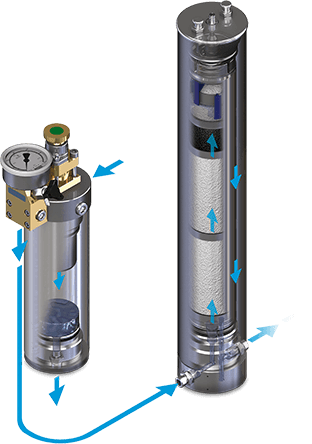 These purification systems eliminate humidity and residual oil in the compressed breathing air. Furthermore, filter cartridges as applied on all BAUER high pressure breathing air compressors with combustion engines (either petrol or diesel) additionally convert carbon monoxide into harmless carbon dioxide by means of a special catalyst. 1 Only with BAUER special filter cartridge with hopcalite up to a maximum concentration of 25 ppm CO in intake air. The compressed clean breathing air then contains a maximum level of 5 ppm CO. The CO2 content in the intake air must not exceed the maximum permitted value according to DIN EN 12021: 2014! Local MAK values are not taken into account. Even the slightest risk is too high. Therefore, each BAUER PureAir station must be equipped with B-SECURUS, the filter monitoring system from BAUER or a drew point sensor in case of online air quality measurement. The filter cartridge shall be handled correctly and exchanged on time. 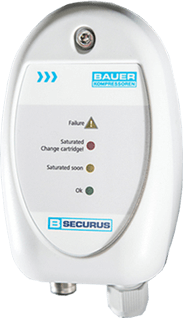 The BAUER electronic filter cartridge saturation control SECURUS continuously monitors the saturation of the filter cartridge by moisture which is actually measured inside the filter cartridge. Furthermore, SECURUS gives warning prior to cartridge exchange and automatically shuts down the compressor installation as soon as the cartridge is saturated by moisture prior to being exchanged. This ensures that the filtering of the cartridge works optimally at all times, reliably avoiding overrunning the life of the cartridge. SECURUS therefore secures purity of the breathing air, optimum use of the filter cartridge life span as well as user safety. The map shows you all the filling centres which are certified as official BAUER PureAir Stations. The navigator on the left enables you to zoom in or out on the map. In order to change from one section of the map to another section simply click on the map and drag the cursor in the required direction. Should you require more information about a particular filling centre, just click on the corresponding marker flag. Stations which have a PureAir Gold status, in which a continuous measurement of oxygen, carbon monoxide, carbon dioxide, oil1 and moisture, can be recognized by clicking on the “Gold certified” logo.